After the state-owned Tatū and Waitewhena mines closed in the early 1970s, many of Ōhura’s small businesses and services shut up shop too. Though a prison was located in the township between 1972 and 2005 and provided an alternative source of employment, it could not replace the mines and had trouble attracting staff. In the 21st century the run-down and empty shops on Ōhura’s main street reflect the township’s decline. 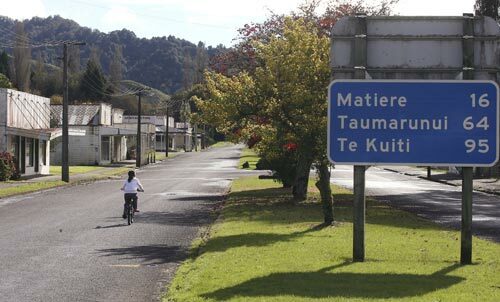 In this 2011 image, the young girl has the carless street to herself, and the blue road sign points to another factor which has contributed to Ōhura’s decline – its distance from the main centres of the King Country. Many properties had been abandoned. However, some residents liked the isolation, and rock-bottom property prices had attracted some new arrivals.